NASA's Mars Exploration Rover Opportunity will spend its fifth Martian winter working at a location informally named "Greeley Haven." 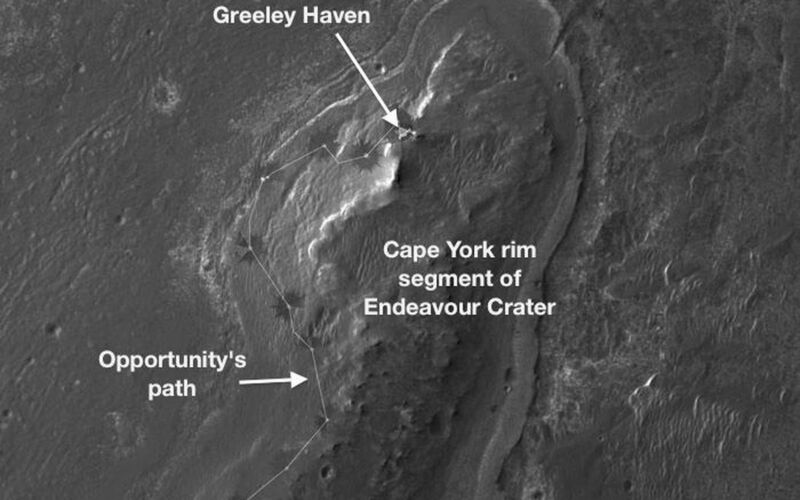 This site is an outcrop near the northern tip of the "Cape York" segment of the western rim of Endeavour Crater. It provides a north-facing slope of 15 degrees or more to aid electric output from Opportunity's solar array. It also presents geological targets of interest for investigating during months of limited mobility while the rover stays on the slope. 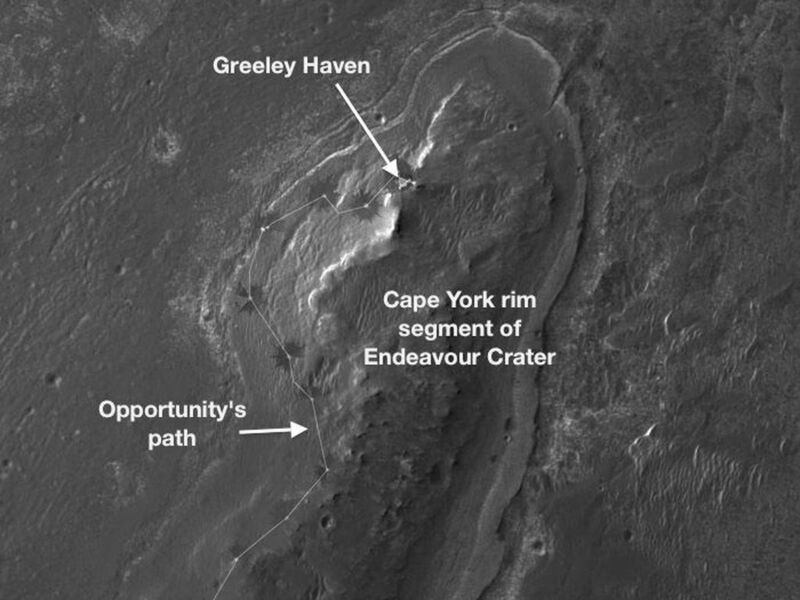 This image, covering an area about 2,000 feet (about 600 meters) wide, indicates the location of Greeley Haven on Cape York. The base image of the map is a portion of an image taken by the High Resolution Imaging Science Experiment (HiRISE) instrument on NASA's Mars Reconnaissance Orbiter, on July 23, 2010. Other image products from this observation are available at http://hirise.lpl.arizona.edu/ESP_018701_1775. 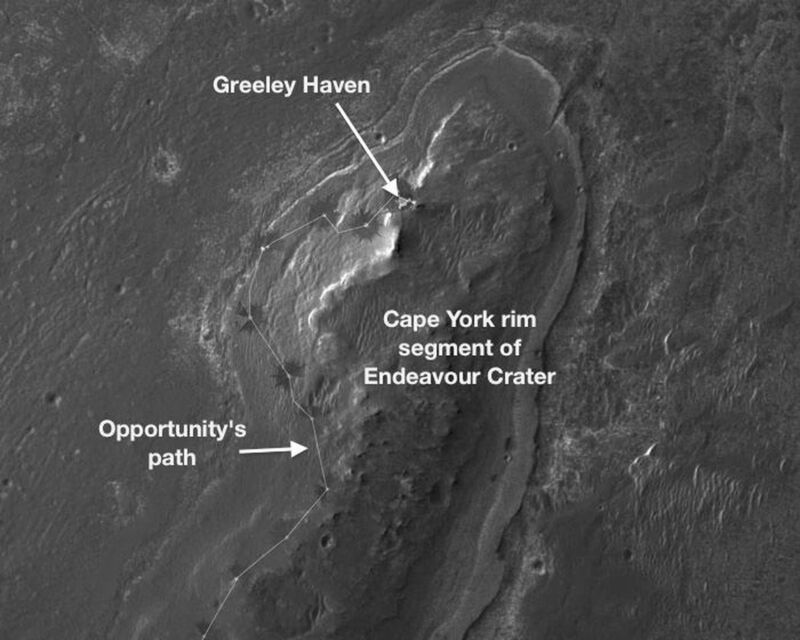 NASA's Jet Propulsion Laboratory, a division of the California Institute of Technology, Pasadena, manages the Mars Exploration Rover Project and the Mars Reconnaissance Orbiter Project for the NASA Science Mission Directorate, Washington.The University of Arizona, Tucson, operates the HiRISE camera, which was built by Ball Aerospace & Technologies Corp., Boulder, Colo. Lockheed Martin Space Systems, Denver, is the spacecraft development and integration contractor for the project and built the spacecraft.